SATURDAY 12 MAY 2018 on the Hill. Please join us for 20 minutes at midday, Saturday 12 May on the Market Hill where we will be having a big share launch photograph. If we are to achieve our aim of restoring the Pub we need to show as much support as possible. 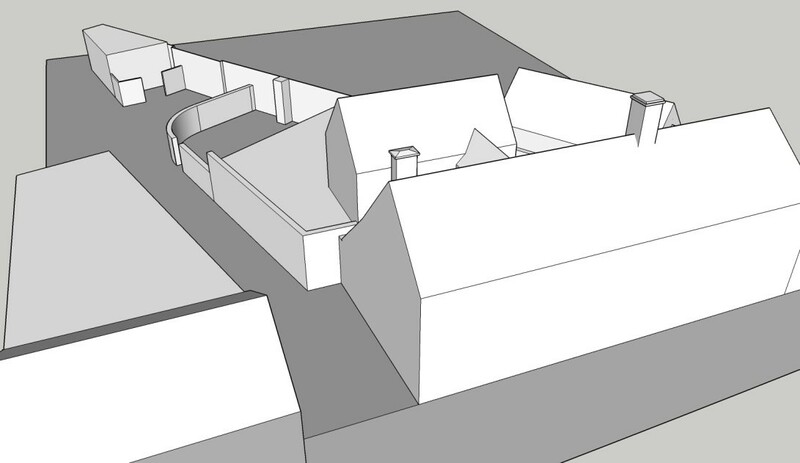 This is an opportunity to show everyone that we care about our village and that if no one else can take responsibility for the building, then we will! See you on the Hill on the 12th May at Midday. There’s a free drinks voucher for everyone that joins us (redeemable when the pub opens). 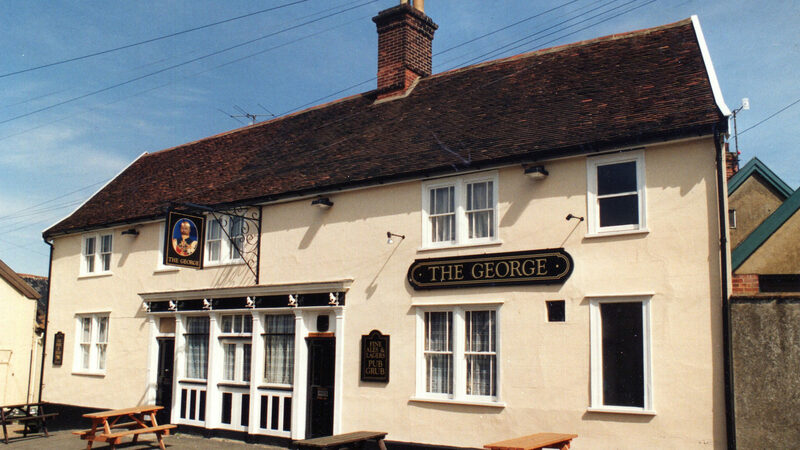 By selling shares we are raising funds to buy and restore the old George pub. Every Wickham Market household will receive a share offer document and application form to buy shares. Please consider investing in the George and by doing so you will be part owner of a fantastic community owned facility. Shares will be available to purchase for 6 weeks after the launch on 12 May. The prospectus and application form will also soon be available for download on the web site. It has been announced in the EADT that Nicholas Jacob Architects, who have prepared the conceptual designs for the new George based on our community’s hopes and needs, and are currently assisting us with our HLF Heritage Enterprise grant application, have also helped the Harwich Electric Palace Cinema to apply for and be awarded the funds enabling the cinema trust to undertake essential conservation work to secure this unique part of Harwich’s heritage for the future. 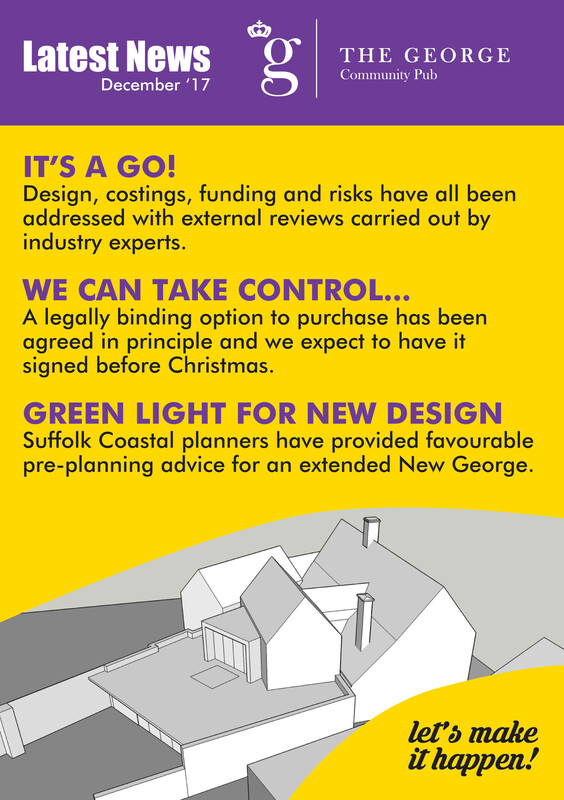 Our Quantity Surveyors, the Daniel Connal Partnership, are also part of the Harwich project team. Congratulations to NJA, DCP and to the Electric Palace! One of the reasons why the share offer has been unavoidably delayed has been that Committee members Bill, Colin, George, Mike and Tony have been hard at work, preparing, submitting and revising the documents for independent assessment for the Community Shares Standard Mark. 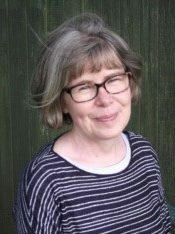 They have been assisted in this by Helen Melia, a business adviser specialising in community finance, who helps share offers like ours on behalf of The Plunkett Foundation. Helen’s invaluable input was funded by Co-Operatives UK’s ‘The Hive’ scheme. We are happy and proud to announce that we have now been awarded the Standard Mark. This is great news for our Share Offer, as the Mark assessment acts as a final check on the quality of a community share offer before its public launch. It means that our supporters can have confidence that the share offer will be well-regulated and supported by a viable business plan. Societies awarded the Mark are required to sign up to a code of practice, which includes agreeing to an open member and public complaints procedure. More excitingly, the Mark opens the pathway to funding, provided via the Community Shares Unit’s Booster Scheme, which could match our members’ investments for the Society (up to, potentially, a sum of £100,000) and to promotion by the Unit of the issue. 28 April Pop up Pub and Karaoke. Come join us in the Village Hall for the next Pop Up Pub on April 28th when we are thrilled to be joined by Apryl from Kiss Karaoke! The Pub will open at 7pm and entertainment will start at 7.30, it promises to be a great evening! Many of you might remember Apryl from when she used to perform in the original George, and she is really excited to be coming back to support our events. So please come along and welcome her back, maybe stretch your vocal chords and sing your favourite tune, or just enjoy having a drink or three at the bar. Whatever your choice, we can’t wait to see you!! 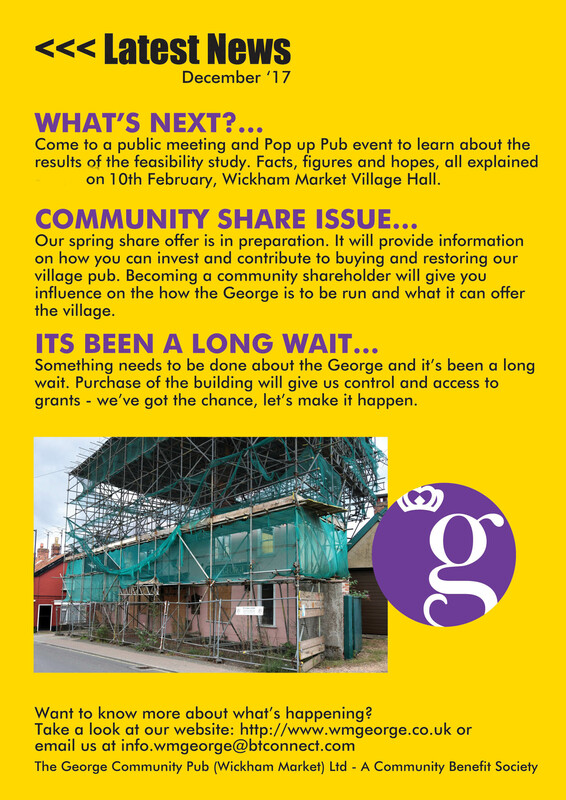 The launch date for The George share issue has been delayed until after Easter. We’re really sorry about this but it is due to circumstances out of our control. Sorry to keep you on tenterhooks but we’ll be back soon with the revised launch date. The vital last funding to enable us to launch our share issue and prepare our application for the major grant from the Heritage Lottery Fund has be awarded to the Society by the AHF on the basis of an application prepared by the Committee. The Project Development Grant of, up to, £7130 match funds equally-appreciated contributions from Suffolk County and Suffolk Coastal District Councils and The Wickham Market Partnership, the Society’s own funds and the proceeds from forthcoming events . AHF had previously, generously supported our feasibility study which apart from the Feasibility Study itself produced a Project Viability Report in the form required by the Fund. This document and the Feasibility Study were described by our AHF Support Officer, Tessa Hilder as, “very clear and thorough” and added that they fully met the Fund’s expectations. The Society is grateful for the continued support of AHF, other funders and the community as we move forward to restoring the historic building as a new George for all. Public meeting held on 10th February. 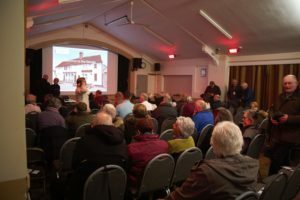 More than 130 local residents attended a presentation held by the George Community Pub team on the afternoon of Saturday 10th February. 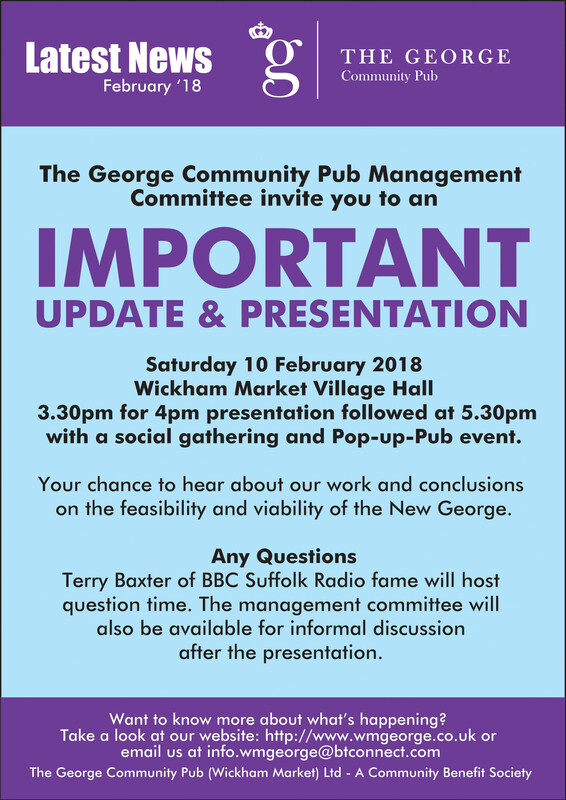 The purpose of the presentation was to bring everyone up-to-date with the work that had been carried out in determining the future of the George as a community Pub. Chairman Colin Owens led the presentation and introduced two ‘special guests’ who happen to be supporters of community pubs. They were Suffolk County Councillor Alexander Nicoll and Terry Baxter of BBC Radio Suffolk fame. The presentation was given by members of the committee, each an expert in their own field of Finance, Heritage, Business Planning and Project Management. The team presented a summary of the committee’s work which included an agreement with the current owner to purchase the George Pub for a sum of £40,000. The committee announced that the Community Share issue will be launched on 16th March 2018 and that if anyone would like to receive a paper copy they could request one by emailing shares.wmgeorge@btconnect.com giving a postal address. The share target would be £300,000 and the remaining £1.3m will be raised through grants from the Heritage Lottery Fund and other grant bodies. The conclusion was very clear that the George could be bought, restored and made into a viable business once again and the whole process will take around 2-3 years before the doors open once again. Following the presentation Councillor Alexander Nichol was invited to address the audience. He thanked the committee for their hard work in producing such a comprehensive report. He also said that Community Pubs had a special feel and atmosphere and he regularly visited the Sorrel Horse at Shottisham. It was easy for him to recommend Community Pubs and wished The George every success – he would definitely be a future shareholder! Terry Baxter led the Question and answer session but ultimately he asked a question of the audience. Would they like to see a pub in the village again? Overwhelmingly the answer was yes. Details from the feasibility study would now be incorporated into a comprehensive Business Plan to be presented alongside the Share Prospectus. Both documents will be made available on our web site in the next few weeks. Friday 23rd March in Wickham Market Village Hall. Sausage & Chips and Veggie Burger & Chips. Do you want answers to the following questions? Can we buy the Pub, and if so what will we be paying? Can we rebuild the pub and how much will it cost? Why does heritage and conservation matter? What do we need Community Shares for? What will the Pub do for the community? When will the Pub be open for business and will it be profitable? Who will run the Pub? What can I do to help make it happen? If so then come to the public meeting on 10th February. Latest News – its a go!